For a dark avenger, there are a surprising number of famous Batman Christmas stories, including well regarded episodes from several animated series, a holiday movie, and even a video game. There have been quite a few Christmas comic issues, as well, over the years, but you wouldn't expect anything else from a character who's been around for seventy-five years with multiple titles a large portion of that time. This was written and illustrated by Lee Bermejo, who's best known as an artist. After reading Noel, I'm a little torn on whether I think he should have stuck with that. On one hand, there are some great ideas in this story and some clever twists. But there are also a huge number of missed opportunities, poor choices, and a general lack of subtlety. I think he had a good starting point here, but that maybe he should have been paired with a more experienced co-writer. This was a solid book as is, but with a little doctoring, I think it could have been a classic. The story centers around both Batman and a henchman working for the Joker. The goon took the job because he needed the cash for his son. After Batman prevents him from delivering some of the Joker's money, he plans to use the criminal - and his son - as bait to catch his nemesis. This is tied to Bob Cratchit and Tiny Tim. Right off the bat, this is a regressive take on the Caped Crusader. Morally, this feels like an obvious throwback to the excessively dark Batman of the 90's. A lot of the comic's defenders point out this was likely intentional, that the story is meant as a critique of that take on the character and medium. I agree that was likely the author's intent, but... that story already exists. It's been done and re-done and re-re-done more times than I can count. Batman starts losing his sense of self and his moral compass to an unrelenting obsession with justice at all costs, and he needs to reconnect with his friends and/or bat-family or discover the goodness in the people of Gotham or something. The version of Batman who is morally vapid, who lacks the level of reflection to realize that poverty forces good people into bad situations - that every criminal isn't beyond redemption - is a caricature. Denny O'Neil was writing Batman stories in the 1970's about class and poverty: reducing Bruce to someone blind to these issues now is baffling. And, while I can respect taking Batman into morally grey areas, having him downright blasé about a child potentially being killed by the Joker is a betrayal of the character. Fortunately, the story moves into more interesting territory as it ties in more elements of A Christmas Carol. The role of Marley is implied by Jason Todd, whose memory haunts Batman. Wisely, this scene is more symbolic than literal - the impression is that Bruce, suffering from exhaustion and sickness, briefly hallucinates his deceased sidekick. Likewise, the Ghost of Christmas Past is more conceptual than literal, with Selena Kyle showing up as Catwoman and reminding Bruce of their past together. This worked well, as did using Superman as the Ghost of Christmas Present. His powers and personality mirror the ghost's from the original story, and Bermejo does a magnificent job following the narrative without it feeling contrived. Using the Joker as the Ghost of Christmas Future worked well enough, though it was a fairly obvious choice. Still, I like how he integrated the grave scene here - sticking Batman in a coffin and burying him alive is absolutely in character for the Clown Prince of Crime. The resolution is almost annoyingly straightforward, with Batman doing exactly what you'd expect. I will note that having Bruce Wayne help out Bob through his company runs a little too closely to a similar - though far more nuanced - moral conundrum in Old Wounds, a fantastic episode of Batman: the Animated Series. There's another element of the writing I haven't addressed, and that's the narration. 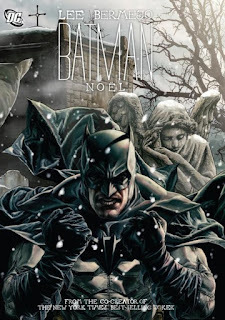 The story is told alongside a distilled retelling of A Christmas Carol, the lettering on which is reminiscent of the Joker's dialogue in the classic graphic novel, Arkham Asylum (the use of Batman's supporting cast as stand-ins for archetypes was also borrowed from that work). Through most of the story, I'd been assuming the narrator was the Joker, essentially making the same connections between Scrooge and Batman that the reader was seeing. At the end, however, it was revealed to be Bob telling the story to his son, which makes decidedly less sense given the way certain elements were twisted to fit closer to the Batman story. I'm really not sure what Bermejo was going for here, but it didn't work. The art, however, is gorgeous - the wintery cityscapes and holiday decorations provide both a juxtaposition and a sense of isolation as needed. In addition, the original designs for the Batsuit and Batmobile are great. Ultimately, this winds up feeling like a mediocre story that could have been amazing with a little more work. There are some really interesting ideas here, but they're undermined by an underdeveloped narration and an over-the-top characterization of the lead. Given how strong the art and concept were, this really could have been something special. Maybe it'll be adapted into an animated DVD some day and there'll be a chance to tighten the bolts and fix the issues. It worked for Under the Red Hood, after all.